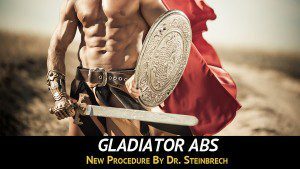 Dr. Steinbrech’s Gladiator Abs procedure has become one of his most popular and it’s understandable why. Using his one-of-a-kind liposuction etching technique, he is able to remove unwanted fat and add natural-looking definition to your abdominal area. This gives men the gladiator-like definition that most people have to work out tirelessly for—with much less time at the gym. Now, Dr. Steinbrech is offering his most popular procedure with one of his other top rated procedures: BodyBanking®. When you use BodyBanking® as an addition to Gladiator Abs, the fat that has been removed from your abdomen gets cleaned and turns into filler that can be used in any other part of your body. Who Would Benefit from Gladiator Abs with BodyBanking®? Prior to the procedure, Dr. Steinbrech will use a marker to draw guidelines on your body to show where fat will need to be removed from. Gladiator abs will typically involve being put under general anesthesia, and will require Dr. Steinbrech to perform a more advanced form of Hi-Def Liposculpting with BodyBanking® on your abdominal area. He will then make a series of small incisions around your belly button, and use a cannula to break up the fat and remove it from your body. Once this is done, the fat will be treated and re-injected into the area of your choice. Healing times can take anywhere from two to four weeks, with compression garments and pain medication being standard. Each procedure will be different from the last, which is why Dr. Steinbrech will require each patient to undergo a consultation prior to having a procedure done. Do you want to make your body look incredible, or just rewind the effects of aging? Have you been seeking out chiseled abs at the gym to no avail? Call Dr. Steinbrech’s office at(646) 480-7750 or click here for a consultation, and we can help you get the results you need.